I have been crazy about curry lately! I have tried many different types and loved them all! 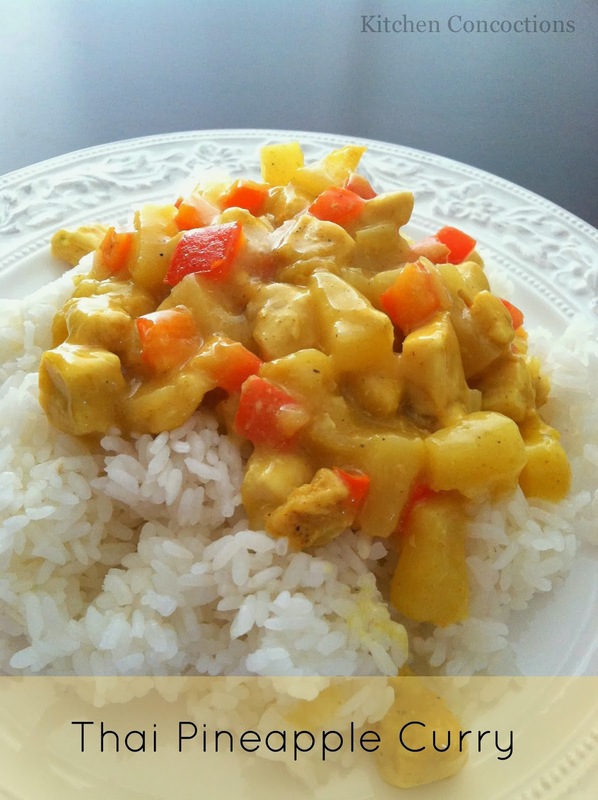 Some that i have tried have been a middle-eastern curry at a ward activity in December, curry fried rice in Nigeria, Hawaiian curry at a local restaurant, and now this Thai curry, which is not to be forgotten! I made this once and made the mistake of not posting the recipe. Then I made it again but forgot the red peppers, a sad mistake, as it was not nearly as flavorful. This time I remembered to post the recipe and I included the peppers! This is seriously a very delicious curry! It is so flavorful! I hope you enjoy it as much as I do! Place the bell pepper, onion, bouillon cubes, chicken and oil in a frying pan or wok over medium high heat. As these are sauteing add the ginger, garlic powder, curry, cayenne and soy sauce. Saute until the chicken is cooked through. Mix the cornstarch into the pineapple or the coconut milk (just so that you aren’t putting dry cornstarch into the frying pan – it won’t combine nicely with the hot mixture) Add the pineapple and its juice, and the coconut milk to the frying pan. Cook until the sauce is thickened. Serve over rice, with a lime for garnish.